Dream Your Ride : Are Motorcycles Everywhere? No! Spring is here, finally! For those of us who live in Winter weather climates, be it snow, ice or rain, and ride, Spring is a time of re-birth. Our motorcycles get dusted off, the tires are aired up, fresh gas is put into the tank and off we go. Our motorcycles are ready to get back on the road, however are we as riders ready to get back on the road? The answer to this question could save your life. As most of us have been off the road for a few months, our "skills" will likely be a little rusty. This includes our powers of observing what's going on around us. 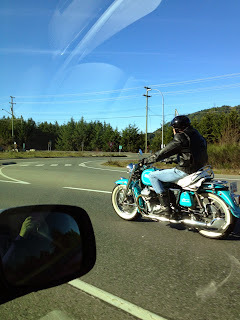 It may take a few days to feel at one with your motorcycle so take the time you need to get "back in the groove". As we've been off the road, drivers of cars and other vehicles with more then 3 wheels haven't seen us either. Their powers of observations are questionable at the best of times and after a few months of not seeing motorcycles, they're even less likely to see us. There's also the typical Winter "changes" to the road surface. Pot holes, left over sand, gravel and salt are hazards that were not there when we put our bikes away. All of these "hazards" can put you on the pavement quickly. In some parts of the world pavement can be loaded with gravel after the Spring "thaw"
Motorcycles are not everywhere as the campaigns say they are so drivers are likely not looking. About 48% of all motorcycle accidents involve the motorcyclist only so become the best rider you can be and pay attention to what's happening on the road. Regardless of fault, any vehicle vs. motorcycle "interaction" will end badly for the motorcyclist. It's your responsibility to keep you safe. Take that responsibility seriously! Practice, practice, practice quick stops! Stopping quickly should be instinctive. We may "share" the road, however size wins! Finally, enjoy the ride! Enjoyment is why we should ride and our passion for riding and being the best rider we can be will help keep us riding for years to come.